This article first appeared on Multiversity Comics on October 21, 2014, but was written by me. It has been published here as well with their very kind permission. Do you remember how you first got into comics? It’s a question I think about fairly often, if only because I don’t remember exactly how I did. The specifics of it are lost to the ages, just like they are for many people, as there are so many different ways to get into them depending on when you started and what you were interested in. But for kids of a certain generation – namely ones who grew up in the late 80’s and early 90’s – there were a few seminal items. My comic book witches brew wasn’t a wholly unique concoction, and it’s a recipe I share with many similarly aged comic fans. There were Marvel’s Transformers comics, which were the first comics I can remember loving. Part of that was because at the time Transformers: The Movie and The Goonies were 1a and 1b as my favorite movies ever at the time, but the cover to “The Transformers” #41 and its mass of battling Transformers was the first time comics really, truly blew my mind. Later on, what really sealed the deal for me were X-Men: The Animated Series and Batman: The Animated Series. Those two shows helped me understand serialized storytelling and appreciate the depth and magic that existed in both of those worlds. To do this day, those are amongst my favorite X-Men or Batman stories ever. But the one thing that stood out above the rest for me wasn’t even a comic, or even a comic like story. For me, it all started with the Marvel Universe cards that Marvel and Impel produced back in 90’s. Those cards and the ones that followed in later sets helped introduce me to all kinds of characters I never knew while also making everything about the Marvel universe feel more accessible than ever before. The cards started with the 100 card Marvel Universe Series One set, which featured Marvel’s greatest heroes, like Iron Man, Wolverine and Captain America, and some less memorable ones as well, including the almost instantly forgotten Foolkiller. The cards attracted fans and collectors thanks to art by names like Arthur Adams, John Romita, Sr. and Walt Simonson while also feeding the minds of everyone who bought them with fight stats and important factoids about the characters, Marvel history, and much more. I remember going home and tearing open packs and learning all kinds of random things that have stuck with me to this day. My opinion of the Celestials was permanently bolstered by the way they broke the power level scale in Marvel Universe Series Three. 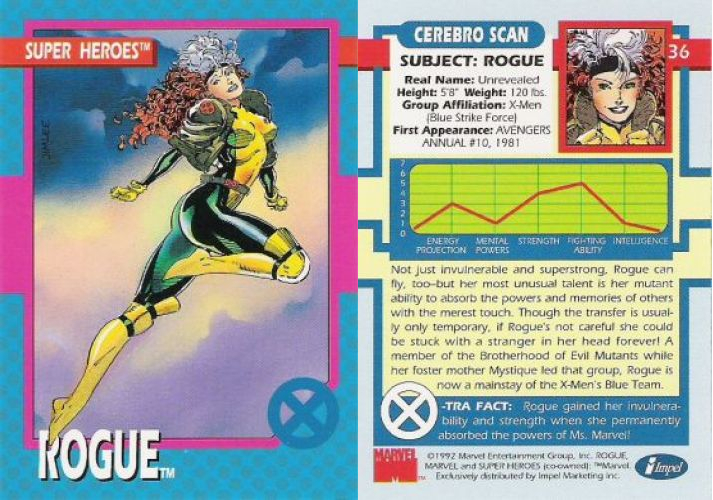 Jim Lee’s Rogue card in his solo X-Men series was, to that point, the single most beautiful thing I’d ever seen. The Aunt May card in the first series made me laugh because of how the stats were changed to “pies baked” instead of “fights won”. These weren’t just cards. These were the heart and power of the Marvel Universe finally being revealed to fans of a certain age, and many others found them similarly exciting. Cartoonist Michel Fiffe (“Copra”, “All-New Ultimates”) shared that sentiment, although his was more art driven even when he was younger. For many though, they weren’t just an exciting hobby, they were one of the gateways into the world of comics. They hit at the right time, just as the comic and trading card booms of the 90’s were taking hold. The cards either helped introduce them to Marvel’s comic universe, or they helped solidify the affinity for them. They were hugely important items in Marvel’s history, but what’s the story behind them, and how did they help influence not just readers, but the creators of tomorrow? Let’s find out as we explore the secret origin of the Marvel Universe cards. “I’ll be honest. They didn’t come from me,” said Bob Budiansky, the former Executive Editor and Special Projects Editor at Marvel. At Marvel, Budiansky was one of the two key architects on the project, with his assistant at the time being the other one. He’s a pretty familiar name with comic fans of today. “Back in those days, Marvel didn’t have a full division devoted to providing key art and licensing support and so forth. There was just Special Projects, which was just two guys, me and Bob,” said Tom Brevoort, Marvel’s current Senior Vice President of Publishing and Executive Editor. At the time, Special Projects had a rather enormous purview. In Brevoort’s words, Special Projects handled “anything that wasn’t a real regular monthly Marvel comic,” and that included approving all the licensed products that came through, creating package art, boxes, ads and everything there, and developing special projects like posters and a graphic novel adaptation of the X-Men animated series. With most projects, Budiansky and Brevoort would wear a lot of different hats, but for the original Marvel Universe cards, it was a particularly sprawling project that touched on many different aspects of Marvel at the time. Editors that worked for Budiansky like Greg Wright and David Wohl were directly involved at times, helping pull in information for the various cards, while writers like Dwayne McDuffie helped contribute to the copy used on the backs of the cards. It was a team effort, but at the center of the project through its most important iterations were Budiansky and Brevoort. While Brevoort shared that as a licensed product, the goal “was to put money in Marvel’s coffers,” both he and Budiansky agreed that their primary goal was simple: make them as worthwhile as they possibly could. “If a Marvel fan was going to be drawn to pick up this thing, (we wanted to make sure) they would get an experience from (the cards) that they would feel was in line with and worthy of their time as a Marvel reader,” Brevoort said. Budiansky believed that was all they really could do as the people at the head of this – or any – project. After that, it was all about making the sausage, and while it was a complicated process with many players; the beginning was simple at the very least. “We’d plot it out together and we’d discuss different artist options and who we’d like to do this character or that character, and (Brevoort) would be the guy who would get on the phone and talk to people,” Budiansky said. As Budiansky shared, this project was very much an attempt to bring the quality and connection of Marvel’s comic product to the cards, so that made it easier on them to bring these cards to life. They used the comics as their bible. While the character list was easy to do, figuring out what information to include wasn’t quite as simple. Both Budiansky and Brevoort had limited experience with cards – Budiansky collected baseball cards in the past, but not at the time – so they had rough ideas of what to include, but some of the cards’ most memorable features were driven by Impel. While I wasn’t able to speak with anyone at the card publisher – which over the years has changed hands a number of times – both Budiansky and Brevoort shared that it was at Impel’s suggestion that statistics like the fight stats of the first series and the power levels that followed should be included as elements on the cards. Much to my chagrin, Brevoort revealed the truth of the first series and its fight stats. That sound you just heard was my childhood crumbling, as I found out that Dagger (of Cloak & Dagger fame) was not in fact one of the most successful heroes of Marvel’s oeuvre like her 73% winning percentage indicated to me as a kid. Stats later on were built on a rock solid foundation however: the old Marvel Handbooks, which were governed by editor Mark Gruenwald. The Handbooks were an excellent resource even beyond the power levels. As Budiansky said, “they wanted to try to be somewhat encyclopedic about it,” as those handbooks themselves were. That led to the inclusion of things like height, weight, eye color and other character information, as well as other easy-to-digest factoids. Budiansky and Brevoort were dealing with an immense amount of information in creating these cards, but thankfully, as Brevoort pointed out, Budiansky was just the man for the job. From there, it was all about making the magic happen and getting the details together. Brevoort, McDuffie and a few others wrote the copy for the first set, but Budiansky wrote the majority of them, including the 20 card test Tom Morgan was the artist for. Budiansky was really the driving factor more than anyone on the first set, as Brevoort shared that Bob was heavily editing – or at the very least copy editing – all of the things that came through on the cards. “He had a strong sense of what the style and what the tone and the flavor of the language should be. How to say things in an expedient manner, because on the back of a trading card you only get like 75 words to tell you everything you need about a character,” Brevoort said. Each card has two sides to it though, and we haven’t even talked about the most important one yet: the art driven fronts. When it came to the art, there were two things Marvel looked for above anything according to Budiansky. It was an easy sell for artists, as special projects gigs like this one were appealing because they paid well for comparatively little work. Because it was an individual character, it was even easier for most artists than a cover, and it gave them a sandbox to really create an iconic shot of a character that the artist either liked or rarely tackled. This appealed to artists, and combined with the good money to make Budiansky and Brevoort’s lives really easy when it came to finding artists. “It was quick and easy money, and I did get to draw a crap load of characters I had never drawn before, from the Avengers to Baron Zemo,” shared Mark Bagley (“Hulk”). Another thing that appealed to artists was that due to the nature of the cards – they were effectively quarter pages – the artists were never hired to do just one. Even with how appealing they were – and they were, as artists like Bill Sienkiewicz, Erik Larsen, Marc Silvestri, John Romita, Jr. and more contributed to sets – sometimes artists would surprise Brevoort with how interested in the gig they really were. “A little iconic shot of each character which I liked doing,” Adams added. 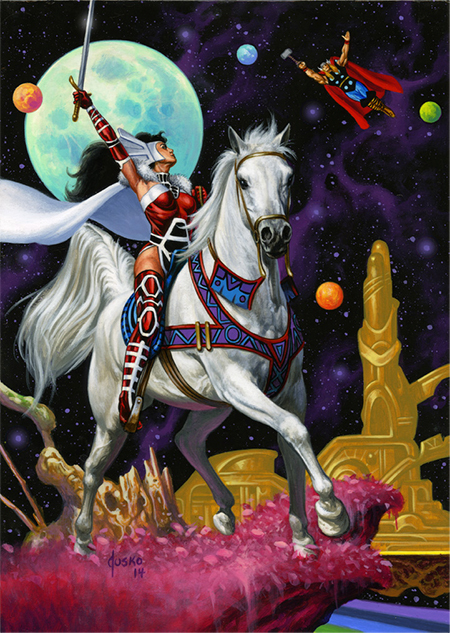 Arthur Adams – or Art, as many know him as – was regularly cited as one of the best and most memorable highlights of the card sets by everyone I spoke to. Piskor’s wish was in fact Adams’ desire, although an unfulfilled one. One year later, Marvel released a set of X-Men cards entirely drawn by Jim Lee, and from there, several other complete sets were drawn by a single artist. Adams was never one of them. Regardless, his cards were hugely impactful, and one of the interesting reasons why is a special paper he used for the job: duotone. This paper, which was used by Eastman & Laird on their “Teenage Mutant Ninja Turtle” series and Wally Wood in the 1950’s and 60’s, stood out at the time to current artists I spoke to like Fiffe and Piskor. “As a kid, I’d stare at those lines thinking that he just used a ruler to create these perfect lines,” Piskor said. Piskor also cited Adams’ level of detail on the cards as something that boggled his mind at the time – “I remember staring at it and seeing these tiny Savage Land men and women, and thinking, this guy can draw 3 millimeter figures better than anyone can draw full size characters” – and a big reason why was the much larger size of paper he was drawing at. “The battle cards I did pretty big. I don’t even remember why. I think just because I’m a goober and I just wanted to spend extra time drawing a bigger picture,” Adams said with a laugh. As the cards increased in popularity, Marvel started exploring other directions to take them and the aforementioned single artist card sets were a natural one for them to go in. This appealed to other artists for many obvious reasons, according to Brevoort. 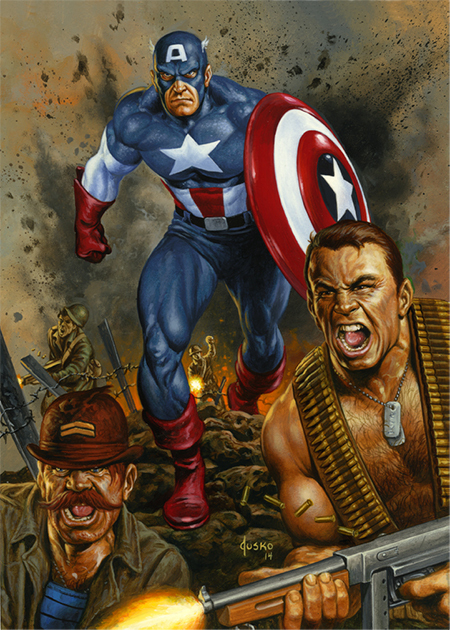 Soon thereafter, other artists got their turn, as Budiansky recruited painter Joe Jusko – who provided the backgrounds for the third series – to create the first fully painted Marvel Masterpieces series. The project was one that Jusko took a lot of pride in, even though it was a hellacious effort for him to get them finished. He had to create all 104 cards in just over three months, which was a Herculean effort that led to him passing on the next set even though it was an enormous success. In fact, to this day, Jusko says this is the project that he is most known for. Bagley, who worked on several sets, was asked to put together a Spider-Man set during his run on “Amazing Spider-Man”, and it’s something that he looks back on very fondly. For many fans, while those cards were well loved, the biggest impact they had was a little known fact. While only an artist for one card in specific – the Mr. Marvel card of Stan Lee from the first Marvel Universe set – one of the most influential people to the visuals of the cards was Arnie Sawyer. In the process of wrestling with Sawyer to get that Mr. Marvel card into the set (Sawyer created it as a piece of art for FOOM Magazine), Budiansky found out that he was a graphic designer who owned his own studio and was a huge comic book fan. From that random card, Marvel picked up a designer who was one of the secret and forgotten architects of the look and feel of these cards. 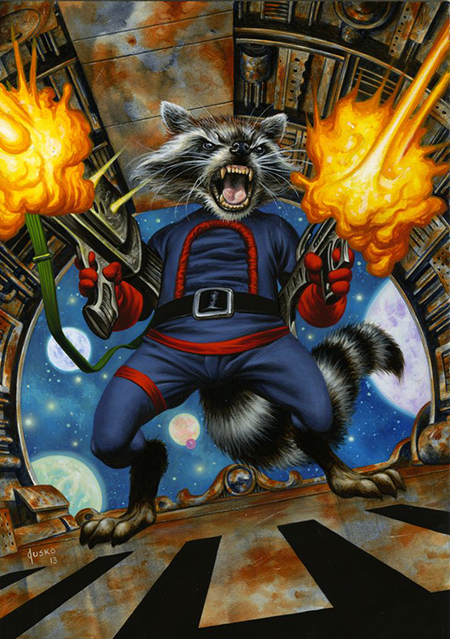 His work started with the second series of Marvel Universe cards, right after the cards exploded in popularity. “The thing about those cards, the first year especially, was they were way more successful than anybody involved had any inkling they would be,” Brevoort said. “They were enormously successful and within a four or five year period, I was responsible for eleven sets of trading cards between that Impel set and when I finished up in 1994 and 1995,” Budiansky said of the success. The popularity shocked Jusko, but in a very happy way. Part of it was bolstered by the nature of trading cards and tactics Impel brought into the product originally. Whatever the reason, the cards were selling like hotcakes, and the card companies couldn’t be happier about the deal they cut with Marvel. There were other contributing factors, including the 1994 baseball strike creating a hole in trading card shops that the Marvel cards filled, that they were available in places like toy stores and big box stores, and more. But for the people who collected them, the kids of that era, the answer to why they were popular was much simpler: they were just awesome. Wilson still has his cards, and remembers everything he loved like it was yesterday, specifically citing the excitement tied to opening a pack, their collectability, and more specifically, the stats and trivia they provided. Dustin Weaver, artist of “Infinity” and “Edge of Spider-Verse” at Marvel, shared that they were a game changer for him. Wilson agreed with that sentiment. For Piskor, they were an escape at times. He was raised Catholic, and the second series was something that helped him make it through Sunday School. “I can’t tell you one thing that I learned in those classes or anything like that. I didn’t pay attention,” he said. “But under the table, I’d fill my pockets up with those Marvel series two – with my doubles because I wasn’t going to screw up my set – I still have them in a binder. My favorite thing to read was the famous battles part of the series. Then it would give you the issues and where these battles first took place. I’d fantasize about reading them, because it’d be impossible to get ahold of Fantastic Four #12 with Hulk versus the Thing. And then I’d just do trivia with myself,” he added. Budiansky thinks, above all, the thing that people really connected with was the art. Adams himself wonders why the cards haven’t maintained their popularity in the same way comics have, but around the time the comic market busted, so did the trading card market. Unlike comics, trading cards haven’t come back as completely, although in a strange way the two of them exist as mirrors of each other. Both face aging audiences without an influx of new fans to bolster their number and expand the lifespan of the medium like these very cards once did. It’s hard to believe, but 2015 marks the 25th anniversary of the first set of the Marvel Universe cards, and people certainly haven’t forgotten about them. Brevoort for one says that editors who work with him today at Marvel grew up with a similar introduction to comics as myself, reading Marvel comics after the cards and the X-Men animated series taught them what the comics were all about. Bagley, Jusko and Adams shared that fans still bring the cards up at cons, sometimes in enormous stacks. They live on in loving tributes from today’s creators, as well. Weaver for one used them as a visual tool to introduce readers to characters in his “Edge of Spider-Verse” issue, as he was creating mostly new characters for that comic. It was something that Weaver absolutely loved doing. For his comic history of hip hop, “Hip Hop Family Tree”, Piskor will be creating cards to use as transition pieces for his weekly postings on Boing Boing when he’s traveling. The first one went up recently – it was the old backwards clothing wearing rappers Kriss Kross – and it was amazing. It’s designed as a tribute to the second series of the Marvel Universe cards, and his plan for them is pretty robust. Much to his delight, Jusko is getting a chance to run the whole thing back, as he’s working with Upper Deck to make a 25th Anniversary set of cards next year entirely painted by him. It’s a dream opportunity for Jusko, and so far, he’s loving it. While it is still a huge project, Jusko promises that each piece is “essentially cover quality art”, and from what we’ve seen, the project looks spectacular. But even with that likely successful set in mind, I had to wonder, could something like the firebrand product the original Marvel Universe cards were happen again in this era? Is there the market for those types of stat and information driven cards, or even the interest in the youth of today to make it as important of an item as it once was for the the readers of tomorrow? Realistically, it isn’t likely. In 1990, these cards were affordable and something that filled a niche for kids that didn’t have comic shops nearby or the ability to access reprints. With digital comics and Wikipedia available as replacement resources, the need isn’t there like it once was, and with 25 years passing by, a bevy of societal and technological shifts changed what kids are interested in today. The product has changed as well, now favoring more art centric cards like Jusko’s upcoming set and ones that incorporate Magic: The Gathering like gaming elements into them. Beyond that, when Marvel worked with Impel on those cards, it was the rare perfect intersection between Marvel’s publishing and licensing sides, creating something that integrated the knowledge and content of the former into the product of the latter. Brevoort shared that it is hard to imagine that happening again. Even without those types of cards ever being as effective as they once were, they’re still hugely important relics of a time gone by. In a way, the cards exist as a snapshot of an era, showing off not just the characters who were important then, but also the artists who were once at the top of the House of Ideas. You can see that in how the characters and artists changed from series to series, with each set representing the year they were made and what made Marvel special at the time. For many, they’re just those cards they see at nearly every garage sale they go to. But for some, they’re timeless, even as they exist mostly in nostalgia fueled memories and dust covered binders today. Thanks to Chris D’Lando, Tom Brevoort, Bob Budiansky, Arthur Adams, Mark Bagley, Joe Jusko, Dustin Weaver, Michel Fiffe, Matt Wilson, Michael Walsh, Ed Piskor, Dave Scheidt and the incredibly useful Big Marvel Cards Tumblr and Marvel.com for the assistance and resources in putting this together.